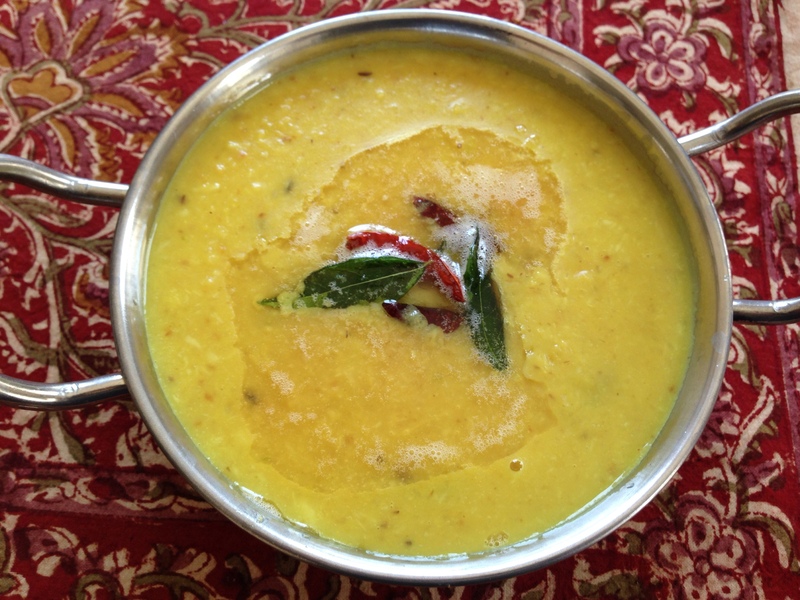 The coconut in this yellow moong dal gives it such a unique flavor. I was looking for a compliment to cabbage theeyal one weekend for brunch and used another recipe from Mareena’s Recipe collection, moong lentil curry with ground coconut. Rather than toasting the coconut like the cabbage theeyal recipe, this one uses raw coconut, raw garlic and raw green chilis ground together and then added later on in cooking the dal. The two dishes went great together and my husband loved them both! Heat the butter in a pressure cooker and toast the yellow moong dal until it starts to brown just a little. Add 4 cups of water, close lid, heat on high until the first whistle, then lower to medium and cook for about 5 minutes. Let the steam out naturally or put cooker under cold running water to let the steam out faster. Open carefully. Blend with an immersian blender . Meanwhile toast the cumin seeds until fragrant, then grind in a grinder/food processor with the shredded coconut, garlic, green chilis and a little water. Add to the dal and salt to taste. In a tadka or other small pan, heat the ghee (if using butter, be careful not to burn) and the curry leaves and red chilis for a few seconds. Pour onto the dal and serve.